How are UAE roads going to change? For years, authorities and experts have been calling for tougher penalties and enforcement that would help curb road violations and reduce traffic deaths. The amended law introduced by the Ministry of Interior (MoI) that goes into effect from today introduces harsh penalties on some violations yet road safety experts argue that strict enforcement and education need to take place. While UAE traffic officials recorded a dramatic decrease in road deaths from 1,072 in 2008 to 725 in 2016, the aim is to further reduce the number of fatalities from current 6.1 per 100,000 population to only three by 2021 and zero fatalities by 2030. Road safety experts stress that the introduction of new rules and fines is only one side of the coin. Thomas Edelmann, founder and managing director of RoadSafetyUAE, said the law must be complemented by strict enforcement on one hand and by education and awareness creating initiatives of governmental entities, the media, corporations who are mindful of the health and safety of their staff, and individual road traffic participants. "Speeding, for example, is the second killer on UAE roads, and more needs to be done to address speeding. This can happen via fines, but more importantly via enforcement and education," said Edelmann. According to MoI figures, sudden swerving/abrupt lane changing has been the top killer on UAE roads, followed by speeding and not leaving enough distance between vehicles. In the first quarter of 2017, tailgating has already killed eight people and seriously injured three in 73 accidents. While the UAE has been recording a general decrease of fatalities, road deaths reached to 725 during 2016, which was up from 675 in 2015. Despite heftier fines and black point system, one person died every 12 hours on the UAE's roads in 2014. In the wider GCC region, a person died every 53 minutes as a result of a traffic accident. 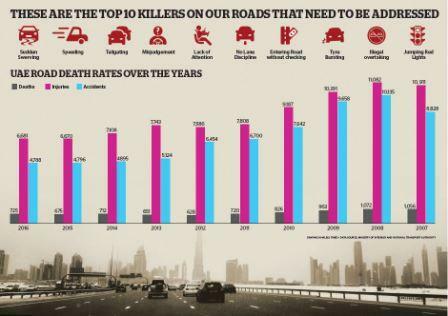 These shocking statistics were the driving force behind the UAE government's target of reducing road deaths to three per 100,000 people by 2021. The UAE has relatively less road deaths compared to the region, but the number is still higher than the West, especially when compared to Sweden that has 2.8 road fatalities for every 100,000 and the UK with mortality rate of about 2.9 as estimated in the World Health Organisation Global Status Report on Road Safety 2015. While road traffic injuries are currently estimated to be the ninth leading cause of death across all age groups globally, they are predicted to become the seventh leading cause of death by 2030. Traffic accidents have been a leading cause of mortality for many years, but WHO reports that most traffic crashes are both predictable and preventable. Now that the UAE is expecting to see fewer road accidents due to the new law, awareness and effective publicity campaigns will be needed to help the enforcement besides the implementation of innovative technologies and deployment of police patrols. New technologies will be implemented on UAE roads to catch road misbehaviour and catch queue jumpers among other violations. In March, for example, the Dubai Police designed a new radar device that can catch motorists who abruptly cut in front of other drivers. Authorities said a week after its introduction at the beginning of February on the streets of Rebat, 3,000 violations for not following the mandatory routes were discovered. Radars in Dubai are now equipped to catch all kinds of violations, including offences such as not wearing a seatbelt, talking on a mobile phone and not maintaining sufficient distance between vehicles. The authority will also introduce point-to-point speed cameras to monitor drivers who accelerate between two cameras on roads where accidents are most common. In Sharjah, 30 new smart radar units have been installed and are now up and running across the emirate's roads. The new tube-shaped radars will primarily target speeding motorists and aggressive tailgaters but can also track a long list of violations. As fixed radars and technologies make it predictable for people to violate, experts have called for introducing new innovative methods that would catch misbehaviours. Thomas Edelmann said with regards to enforcement, more innovative technologies need to be introduced including mobile radar units, police officers with portable radar devices, section-control/average speed radar installations and CCTV monitored critical areas of 'misbehaviour.' He urged for more police presence on the roads. "We need to implement the element of surprise. Motorists know the location of fixed radars and slow down just before and speed on thereafter. These radars are only 'electronic speed bumps', but we need to better the overall behaviour on the roads," he said. He added that motorists must drive with the feeling of being observed, to curb potential misbehaviour and reckless acts of driving.